From the early violin-led divertimentos to true equality between its four instruments, Haydn perfected the classical string quartet with his Op.76. Like most of his earlier string quartets, Op.76 also comprises six numbers, the most popular being No.3, the so-called Emperor whose Adagio theme the Austrians and eventually Germans adopted for their national anthem. No.5 nicknamed Largo due to the beautiful centerpiece, which Norwegian Engegård Quartet chose to record here has one of Haydn's innovative devices of the time. It's a cyclic form wherein all four movements are closely knitted together with the same theme. Of course, the cyclical form has a very loose meaning. It could imply repeating the same melody in another movement or movements rather like a musical thought recalling the past or a leitmotiv. However, here Haydn skillfully modulated the cyclical form by transforming the initial melodic motif with new thematic treatments or variations on a theme. The connections are there no matter how subtle but repetitions are avoided. Hence the high-spirited Allegretto flows naturally into the cantabile Largo that is somewhat lamenting and pensive in mood akin only to the Romantics, and the scherzo-like minuet migrates freely into the humorous bouncing finale. When you listen carefully, they're all derivative of the theme first heard in the opening movement. The Engegård Quartet sails through the mood changes with natural intuition. Though also mapped along the cyclical form, Grieg's Op.27 is epic in scale and fully charged with high-wattage emotions. After losing his parents and daughter, Grieg was plunged into an emotional abyss and separated from his wife. Through this self-confessional work, Grieg not only regained his creative confidence but also salvaged his marriage. Yes, the four-movement quartet could have been a symphony but Grieg made it more intimate without losing dynamic impact. The sentiments spread through the movements like a Nordic novel with heart-wrenching chapters and scenes of suffering, sweet memories, bitter struggles and thanksgiving. 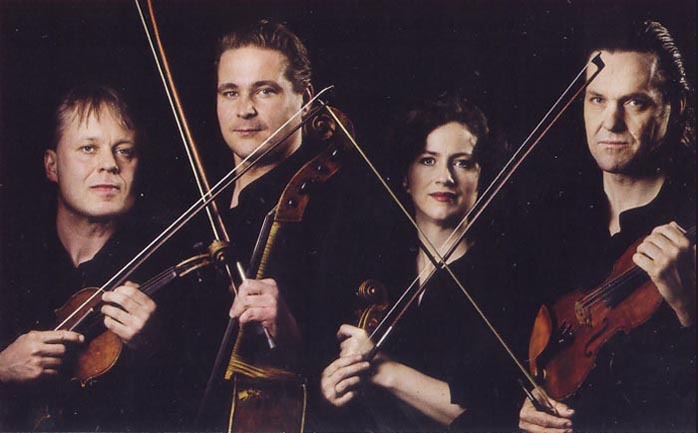 The level of intensity is quite uncommon for string quartets and definitely comparable to that of Tchaikovsky or Janáček. The Engegård Quartet has given their reason for coupling the two seemingly unrelated quartets in one album as a great way to sample their masterly virtuoso in handling two contrasting works which after all are not that dissimilar in compositional treatment. They imbue the Haydn with golden Viennese sonority (especially the Largo) and elegance (the Allegretto), then apply a dare-to-bare-all approach to the Grieg with unrelenting pathos and occasional abrasive brute force that tear and rip a wounded soul. 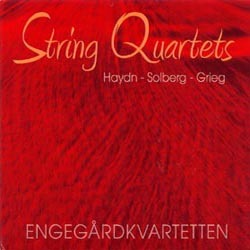 The B minor String Quartet by Norwegian composer Leif Solberg (b. 1914) is a world-premiere recording. Composed in 1945 in the classical vein, this is a lovely discovery for anyone who likes Mozartean minuets, classical fugue and a dash of Norwegian folklore inspiration. 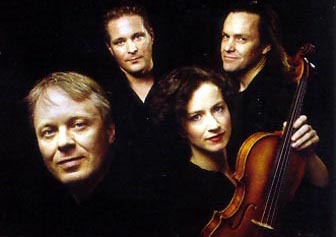 The Engegård Quartet was founded in 2006 but all its members -- violinists Arvid Engegård and Atle Sponberg, violist Juliet Jopling (the only Brit in the group) and cellist Jan-Erik Gustafsson -- have been concertmasters or members of leading Scandinavian, European orchestras and chamber ensembles for many years. They play like one instrument with virtuosic precision and spontaneous emotional expressiveness that clearly define the Classical elegance and Romantic sentiments. 2L is a devoted advocate of SACD and they know how to maximize the potential of the multi-channel format by placing the musicians around the five microphones even for this quartet recording. Imagine how it would sound in multi-channel mode when you have the following microphone layout: front left first violin, front right second violin, center in between, rear left viola and rear right cello. I run two multi-channel systems of very different characters. The Marantz SA8260 / Elekit / Antique Sound Lab / Klipsch F2 system is all tube with high-efficiency floorstanders and therefore more musical. On the other hand, the Philips DVP9000S/Winsome Labs Mouse / Mark & Daniel Sapphire & Topaz setup offers clean-cut imaging and dynamics, aka the studio monitoring version. Thanks to 2L's high-resolution DXD recording technique that boasts four times the data of DSD, sonority is lifelike and soundstage is three-dimensional even on the tube system. With separate components instead of receivers, I have precise control over volume settings for each channel and I usually dial down the rear. That works fine for most multi-channel SACDs but not for 2L if you want to experience what their engineer had in mind. When I turn the rear volume down (about 30 to 40% of the front), I don't get the surround effect the above miking layout intends. Instead I have the ensemble -- viola, first violin, second violin and cello -- in front from left to right, bearing in mind that the front mikes still picked up signals from the rear instruments. In other words, multi-channel with truncated rears sounds almost like stereo mode except multi-channel has more immediacy and the stereo soundstage is deeper and wider. No matter which mode, even Red Book CD, the same holographic presence is discretely preserved as obviously another intended side benefit of down-mixing from the individually mike'd master tracks. When I discussed this with Morten Lindberg, the mastermind behind 2L, he replied: "For this album I found a way to fold the rear channels onto the front that actually makes the rear fall outside the speakers, extending the stereo image. This was done in the 90s with Q-sound but caused a terrible phase problem. This is now done entirely by placement of the microphones and without any negative side effects." In essence, you don't need multi-channel to experience this sonic palpability. Perhaps from now on all stereo recordings should be done that way?